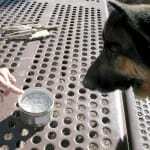 Musher Dog Wyatt gets blessed with Spirit Bucky’s ashes on the Feast of Saint Francis Day. Tripawd Wyatt Ray Dawg meets up with the Odaroloc Sled Dogs and goes mushing in Telluride, Colorado. 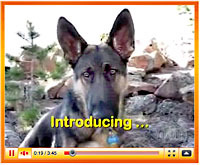 Wyatt the three-legged German Shepherd wants to eat Diggin Dust Heritage Hogs for dinner in Colorado. Tripawds Spokesdog Wyatt pays respects to Karma’s Mom in Willard, Colorado. Four three-legged German Shepherds and one mix named Smokey B gather for a pawty in Colorado mountains.